INTERIORS is the title of a six-artist group exhibition that will open at ACME Fine Art in Boston on Saturday, 13 April 2013. The exhibition will feature classic paintings by twentieth century modern artists who practiced in Provincetown as well as cutting edge contemporary artwork created specifically for this exhibition by artists who have been fellows at the Fine Arts Work Center in Provincetown. The exhibition will be on view through 25 May, 2013 at the gallery and on-line at www.acmefineart.com. Maurice Freedman was very much a “mid-century modern” artist. Freedman’s brilliantly colorful paintings of interior scenes at once visually recall his study with Max Beckman during the first half of the twentieth century and at the same time illuminate his own personal outward-looking experiences of both Provincetown and his studio in New York. His work expressively captures both time and space. 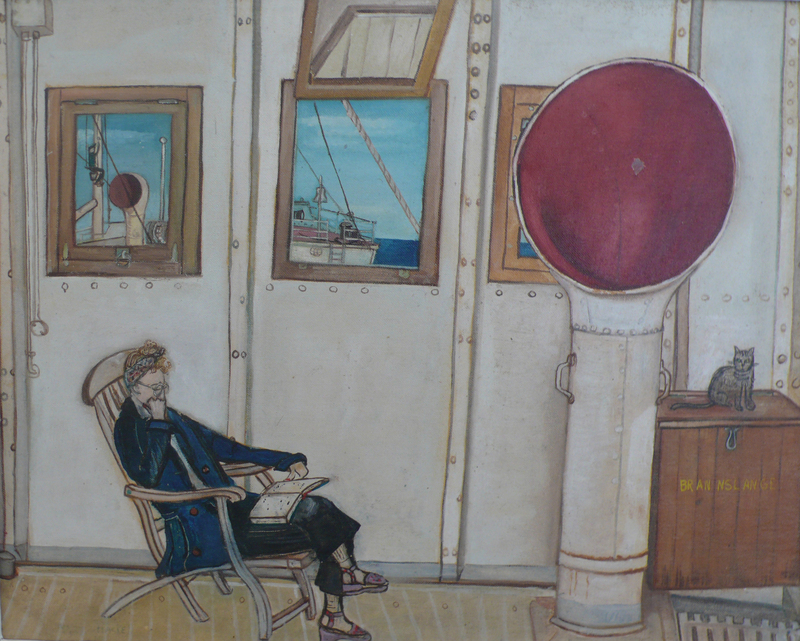 Mary Hackett was a self-taught painter and longtime resident of Provincetown. Her scenes of everyday life contain numerous symbolic and memory-laden objects placed in an often naïvely constructed space that together create an autobiographical narrative that is so compelling that Hackett has developed a formidable cult following among those fortunate enough to know and collect her rare creations. Sharli Powers Land was a fellow at the Fine Arts Work Center in 1969-‘70. Her boldly evocative paintings have an uncanny appeal with a dynamic composition and a palette that is downright explosive. Land’s interior views capture a sense of place while often making reference to a place in time through the incorporation of formal references to her contemporaries such as Mary Hackett and Myron Stout. Samuel Messer was a fellow at the Fine Arts Work Center in 1981. Messer is currently Associate Dean of the Art program at Yale University. His interior portraits are wildly expressive paeans to his subject. They convey an all-encompassing vision of their sitter through the loosely rendered likeness that is central to the composition and through the complex interior environment created by Messer. Meghan Gordon was a recent fellow at the Fine Arts Work Center. Gordon’s artwork relies heavily on art-historical research. She creates paintings/drawings, objects, film, and installations that create an alternative art history that actively engages and challenges the observer. The interior is consistently a crucial theme and component of Gordon’s artistry. Paul Kelly is a contemporary artist living in Provincetown whose subject matter is most often Cape related. Kelly’s paintings have an elegantly edited quality both in palette and in composition. The resultant views appear both true to their location and completely abstract, simultaneously. Like Freedman, this artist is interested in the view through the opening; however, in Kelly’s interiors all but the essential has been eliminated. Beyond the obvious links having to do with the outer Cape, the INTERIORS exhibition will explore common threads in the genre as evidenced in the works by these six important 20th and 21st century artists. Some of the common threads are: visual and formal interests in the relationships between inside and out vis-à-vis the notion of containment, the use of personal objects as symbols and the meanings associated with them, the manipulation of perspective to enhance a sense of space and volume, the introduction of historical references and the connections such references make with the observer, and how the introduction of the figure –portrait or self-portrait- animates the interior. A special Exhibition Preview Event to benefit the Fine Arts Work Center will be hosted by the Galleries at 38 Newbury Street on Friday 12 May. Drinks and hors d’oeuvres, catered by MAX Ultimate Food, will be served between 6:00 and 8:00 p.m. In celebration of National Poetry Month, special guests at the event will also include Robert Pinsky, US Poet Laureate (1997-2000), and poet John Murillo, Fine Arts Work Center writing Fellow (2007-2008). Tickets for the preview can be purchased through the Fine Arts Work Center (www.fawc.org/tickets) or by phone at 508-487-9960 x 101. Please contact the gallery for further information.